Love the plaid stars! Perfectly clean and simple - love it! Love the design Sylvie, the tartan stars are gorgeous! Fabulous Christmas card Sylvie, love those tartan stars. I LOVE your tartan stars - just fabulous! Love your Tartan stars Sylvie, fabulous card. Great CAS card Sylvie! Love the idea of tartan stars! gorgeouse bag and lovely look. A star of a Christmas card!!! Love it!! Just shows you don't need loads on a card to end up with a beautiful result. Love your card Sylvie. Great tartan stars. 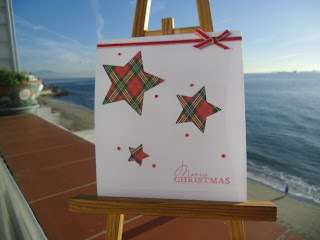 Hi Sylvie, I do love the plaid stars...very festive...and a great card! I think I might know you...I lived in La linea from 2005 - 2009...Are you friends with Debbie from Decorative Crafts? Hi Sylvie, Love it, the image is sooo cute and the layout is fab. I am late as usual but It is made and will be on today sometime. Loved using the red and white. You seem to have disappeared from my blog list so going to follow you again, don't know what happened there. I'm gone to inform my little brother, that he should also visit this web site on regular basis to obtain updated from most up-to-date gossip. I'm really impressed together with your writing abilities and also with the structure in your blog. Is that this a paid subject matter or did you modify it yourself? Anyway keep up the nice quality writing, it is uncommon to peer a great weblog like this one these days..
What's up to all, how is everything, I think every one is getting more from this web page, and your views are pleasant in favor of new visitors. Hi there to all, as I am truly eager of reading this weblog's post to be updated on a regular basis. It contains good information. Asking questions are really fastidious thing if you are not understanding anything totally, but this article presents nice understanding even. informative. I'm gonna be careful for brussels. I will be grateful in the event you continue this in future. A lot of people will likely be benefited out of your writing. Cheers! are going to a famous blogger when you aren't already. Cheers! this topic for ages and yours is the greatest I've discovered till now. However, what concerning the conclusion? Are you certain concerning the supply? What's up, its nice post regarding media print, we all be familiar with media is a fantastic source of data. I tend not to comment, but after looking at a ton of responses on "St.Lukes Hospice Challenge". I do have a couple of questions for you if it's allright. Could it be simply me or does it look like a few of these responses come across as if they are coming from brain dead folks? :-P And, if you are posting on other social sites, I would like to follow you. Could you list of all of your social community pages like your linkedin profile, Facebook page or twitter feed? I do write in my journal on a daily basis. I'd like to start a blog so I will be able to share my own experience and views online. Please let me know if you have any suggestions or tips for new aspiring blog owners. Thankyou! sites, I'd like to follow you. Would you post a list of the complete urls of all your social community pages like your linkedin profile, Facebook page or twitter feed? Hi it's me, I am also visiting this web page regularly, this web site is truly good and the visitors are genuinely sharing good thoughts. a correspondence extra about your post on AOL? I require an expert in this area to solve my problem. I'm gone to tell my little brother, that he should also pay a visit this web site on regular basis to take updated from most up-to-date news update. An outstanding share! I've just forwarded this onto a coworker who has been doing a little research on this. And he actually bought me lunch simply because I found it for him... lol. So let me reword this.... Thanks for the meal!! But yeah, thanx for spending time to talk about this issue here on your blog. learn much more from you. This is really a wonderful web site. and nice arguments commented here, I am truly enjoying by these.